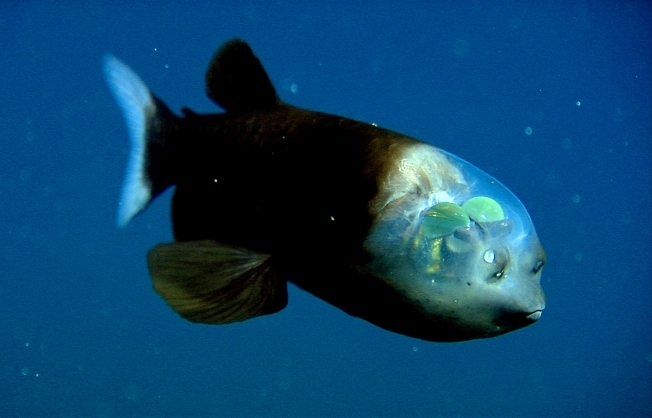 The "barreleye" fish have see-through heads that allow them to visually track their prey, scientists discovered Monday. The "barreleye" fish gives a new meaning to "clear-headed" -- members of the central California species Macropinna microstoma have fully transparent skulls filled with a jelly-like fluid that scientists discovered this week allows the fish 360-degree vision. You read that right, transparent skulls. Scientists at the Monterey Bay Aquarium Research Institute announced Monday that they had solved a nearly 50-year mystery behind the fish, explaining that the neon green, bulbous eyes inside their see-through heads can fully rotate - dispelling previous claims that their eyes were stuck in "tunnel vision." The eyes of the barreleye fish are extremely light-sensitive, so the fish tend to swim close to the depths of the ocean - making it hard to study the species, researchers said. Newly developed vehicles designed for deep-sea research allowed the scientists access to the bottom-dwellers. They carefully brought one fish ashore and determined they had been wrong for nearly half a century about the fish's sight capabilities. The barreleyes also have flat fins that let them remain motionless in the water - any sudden or intense movement can upset their fragile "headgear."